Recently at Mobile World Congress in Barcelona, we launched the expanded SAP Cloud Platform (formerly SAP HANA Cloud Platform) along with new enhancements and capabilities that power our customers’, our partners’, and our own innovation. Over the years, SAP Cloud Platform has evolved into a comprehensive innovation platform in the cloud to support businesses in their digital transformation journey. It started with SAP HANA as a database-as-a-service plus capabilities to develop mobile, HTML applications with strong integration and security. Since its launch, SAP Cloud Platform has evolved into a strategic platform as a service (PaaS) with over 40 application services designed to meet the needs of our customers and partners looking to leverage innovative technologies such as IoT, machine learning, artificial intelligence and big data on a cloud platform. To understand more about the reasons behind the rebranding exercise, read Emily Mui’s blog. SAP Cloud Platform continues to be an agile in-memory cloud development and deployment platform with SAP HANA as a core capability but now has a rich set of services that enables our customers to integrate, extend and build applications in the cloud to meet their business needs. To date, SAP has introduced into the market a number of enterprise cloud applications on top of SAP Cloud Platform (e.g. SAP BusinessObjects Cloud, Digital Boardroom, SAP Product Stewardship Network, etc.). It is also the platform for SAP Leonardo, SAP’s portfolio of IoT applications that connects intelligent devices with people and processes, and SAP Clea, the portfolio of Machine Learning apps. SAP Cloud Platform is also one of three strategic pillars of SAP solutions alongside SAP HANA Platform and SAP S/4 HANA. To get a deeper perspective into the rebranding read Matthias Steiner’s blog. As you can see, we have also added many new cloud services to SAP Cloud Platform. Read the recent press release. Furthermore, many existing services have become more important to establish SAP Cloud Platform as the PaaS for customers and partners to integrate, extend, and build applications supporting their SAP investment. nomenclature to make our service names more clear and concise to our customers and partners we have also renamed many of existing services. Below is a list of the rebranded service names and categories. Below is a table mapping current service names to new names. 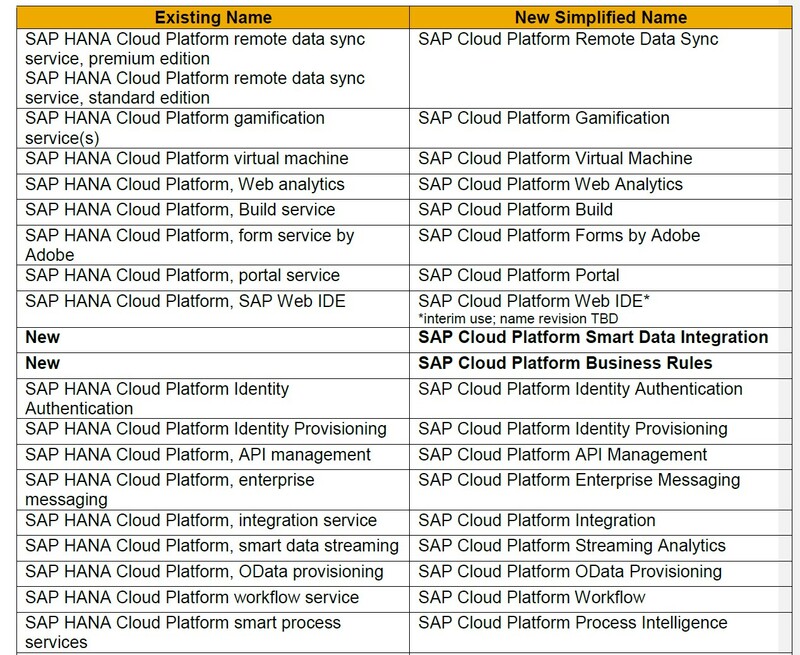 Regarding SAP Cloud Platform Mobile Services and Internet of Things below table describes how the previous names will be consolidated into one umbrella name. Below is the list of mapping to new names. Please contact Hamsa Buvaraghan/ Holger Seubert for questions and refer to SAP Cloud Platform home page for more details on the services.